I have made this CD set last year, it contains Alan Moore related music from my collection. 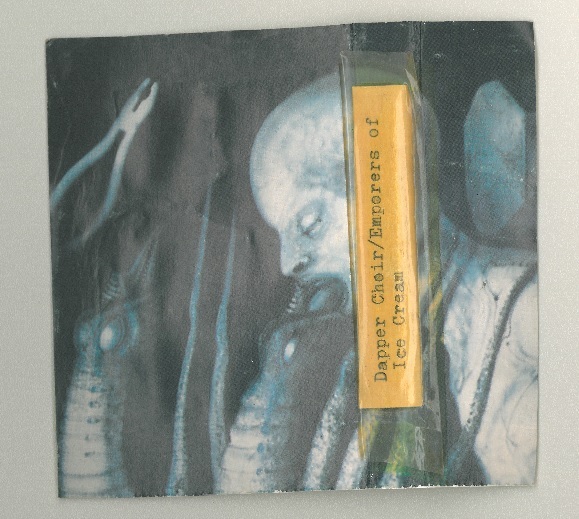 First CD has studio recording of The Satanic Nurses / Emperors of Ice Cream (second incarnation). Longer version of ‘The Murders on the Rue Morgue’ (track 2) can be found on Storyteller CD, listed as The Satanic Nurses. Track 1 and 3 are sourced from the same recording so they could be Nurses tracks as well. Some Emperors tracks can be found on Storyteller CD also but there are few unreleased songs there like ‘London’, ‘Positively Bridge Street’ and Intro. CD 2 has the live recording of Emperors UFO gig mentioned in ‘Magic Words: The Extraordinary Life of Alan Moore‘ book, studio version of Emperors take on ‘Old Gangsters Never Die’ and 2 tracks with Pat Fish (‘Trampling Tokyo’ also available on Storyteller CD). CD 3 has some odd tracks taken from old tapes including Alex Green’s home demos for the early Emperors of Ice Cream from ’78, instrumental demos of Mystery Guest‘s ‘Wurlitzer Junction’, live versions of Mystery Guests songs with Alan Moore lyrics, D-Go-Tees versions of 2 early Emperors songs and a D-Go-Tees song with Alan Moore lyrics. Tim Perkins’ pre-Emperors of Ice Cream band comprising later Emperors members Chris Barber and Pete BrownJohn. Glyn Bush’s Birmingham-based band. 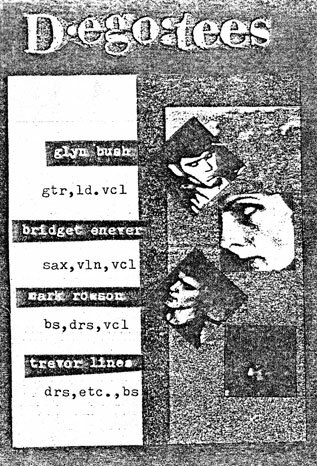 Lineup also comprises Bridget Enever, Mark Rowson and Trevor Lines. Glyn Bush wrote Skyscraper for a proposed band. Alternate version of that song has been recorded by Alex Green for The Emperors of Ice Cream. 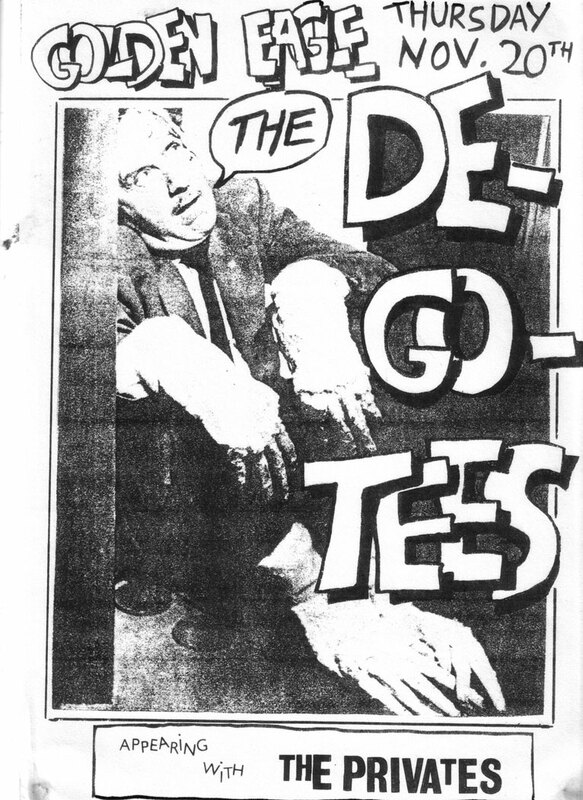 First mention of Degootees name. … the line up was: Grant Series (Gtr, vocs), Alex Green (sax) David Hunt (BS) Geoff Webb (drs). We were supporting Bauhaus 1919. 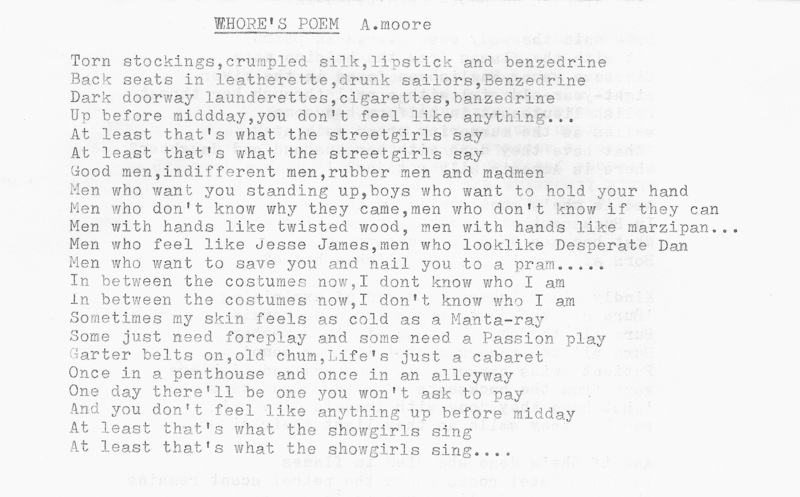 Alan Moore wrote lyrics for a De-Go-Tees song called ‘The Age of Bavaria’. Demo has been recorded few months later. 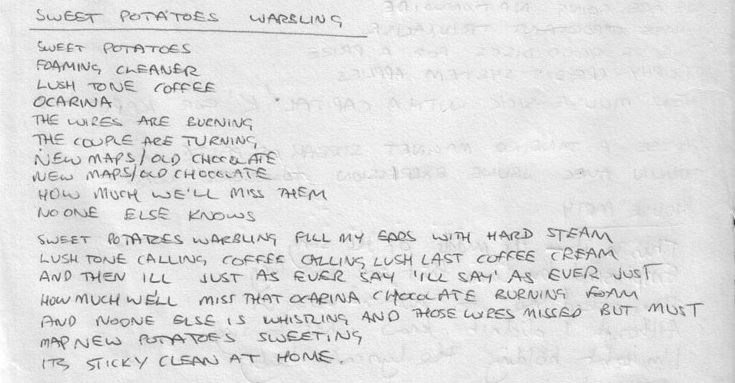 Regarding Lance Parkin’s Magic Words book, second incarnation of Emperors of Ice Cream also had a song with that name, probably the same lyrics with different music. 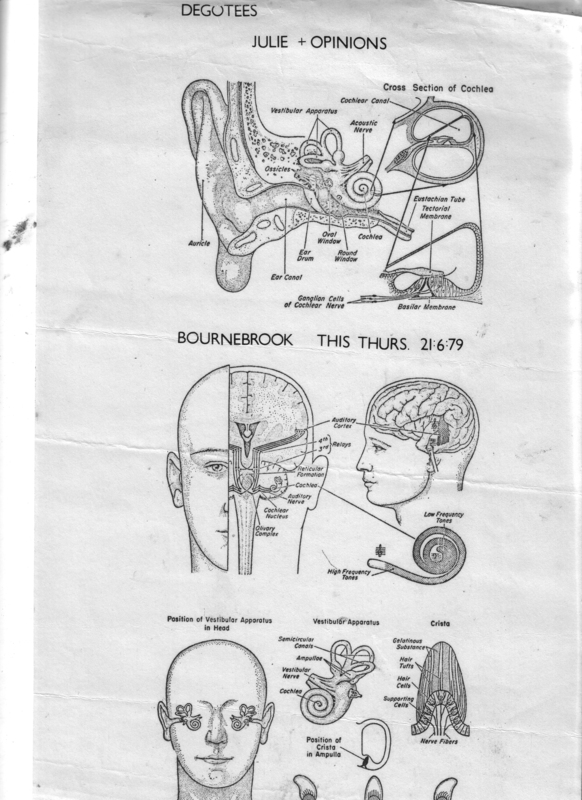 1-4 are from the Sinewave Studio session, line up GB gtr, voc, clarinet, Bridget Enever sax, violin, Mark Rowson bs Trevor Lines drums the rest are from a recording session at Mark’s house around 1980, line up the same except it may have been Geoff Webb on drums. 7 and 10 were written by Alex Green and 14 yes the lyrics were by Alan Moore. 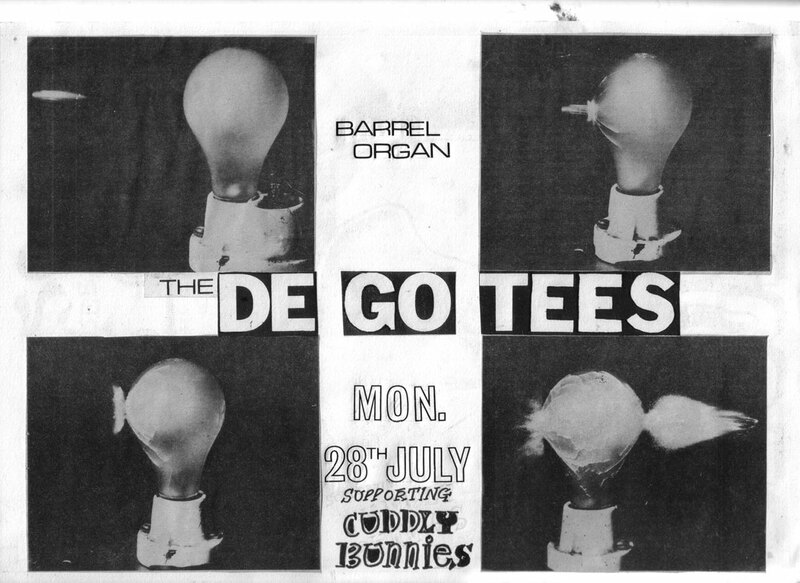 Sax player Alex Green (later known as Max Akropolis of The Sinister Ducks) played in a jazz-funk band Escalator with Adrian Utley (later member of Portishead), Andy Kennedy, Coach York and Will Ballard. 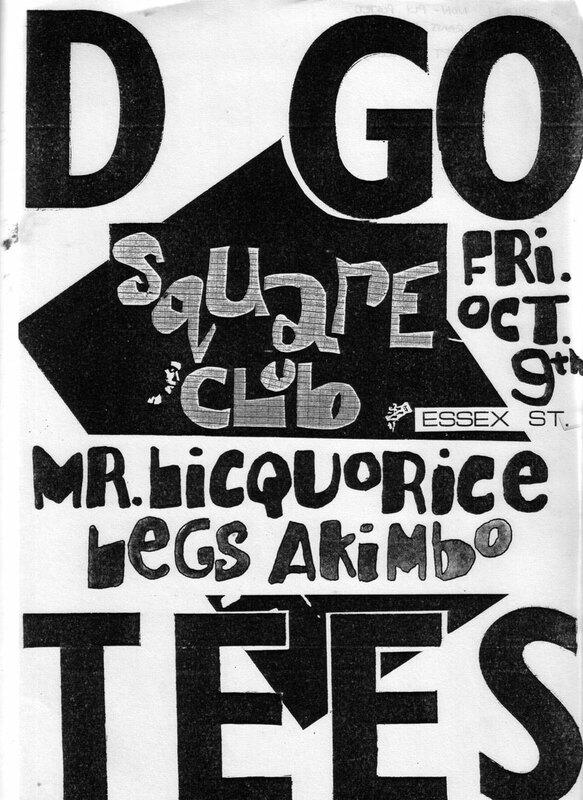 He also played with Stanton Walgrave, ’an occasional totally improvised band’ comprised of Glyn Bush (later member of Rocker HiFi), Pickle (aka Mr. Liquorice), Seaweed and Shriws. Alex talked to Glyn Bush about his ’Weirdo Rock Big Band’ idea. Glyn suggested him to speak with Alan Moore. Escalator reunion gig at the Racehorse. They did songs like ’ Chameleon’, ’Vacuum Cleaners’, ’Blue Bossa’ and ’Hasten Slowly’. Alex discussed his Emperors ideas with Coach York and Adrian Utley. I remember Alex always talking about the Emperors of Ice Cream – I didn’t join, you may be right about its virtual nature. Pickle recommended Baby Mac as a possible drummer. He also offered to help with any technical hassles. Emporers of Ice Cream was Alex and Alan’s brainchild. I was called in to help work on some of the arrangements and to teach Alex how to play them on electric guitar. He was, you understand, a sax player. Would have been great if it had ever got beyond it’s conceptual stage. Alex worked out the basis melodies for Sweet Potatoes Warblin’. Original idea of that song came from Glyn Bush back in February. Escalator played at Threnody and Gallstone. First mention of Alex Green’s and Glyn Bush’s alter-egos, Max Accropolis and Grant Series. Alex used that pseudonym later with The Sinister Ducks but spelling has been changed to Max Akropolis (as Alan Moore used to write it). Alex worked out the framework for Where is Amnesia Silver? Baby Mac (drums) joined the band. 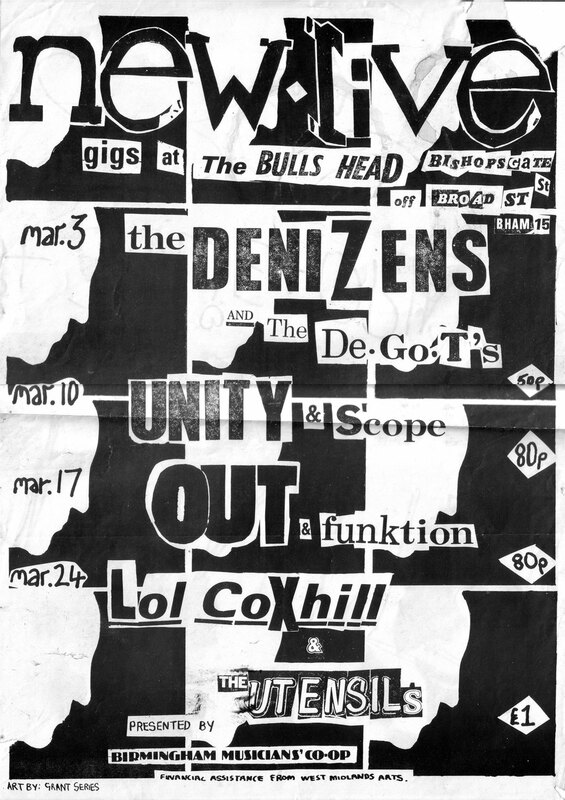 Coil (new wave band) asked Alex to play sax on a few of their numbers. 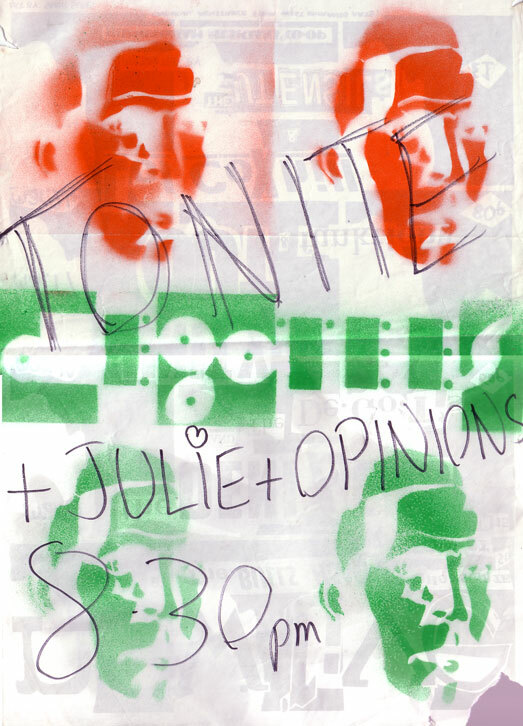 Alex started to organize a joint party at Xmas for Coil/The Emperor (which never happened). Alex have taped a few home demos including Do The Bums Rush. Alex placed an advert for musicians in the Northampton Chronicle and Echo. Alex and Alan attempted to tape We Are The Emperors, Beneath A Pandamoon, A Big Future and Night Flies Run On Alley Time in a rehersal place called ‘The Kitchen’. They have the last 2 numbers done. Alex received 2 replies to his advert for guitarists. 2, Andy Broughton (he played in Eskimo Joe with Adrian Utley and Generation X before they got famous). Dave Haskins also replied to the advert later. Alex had (possibly instrumental) taped versions of Skyscraper and We Are The Emperors. 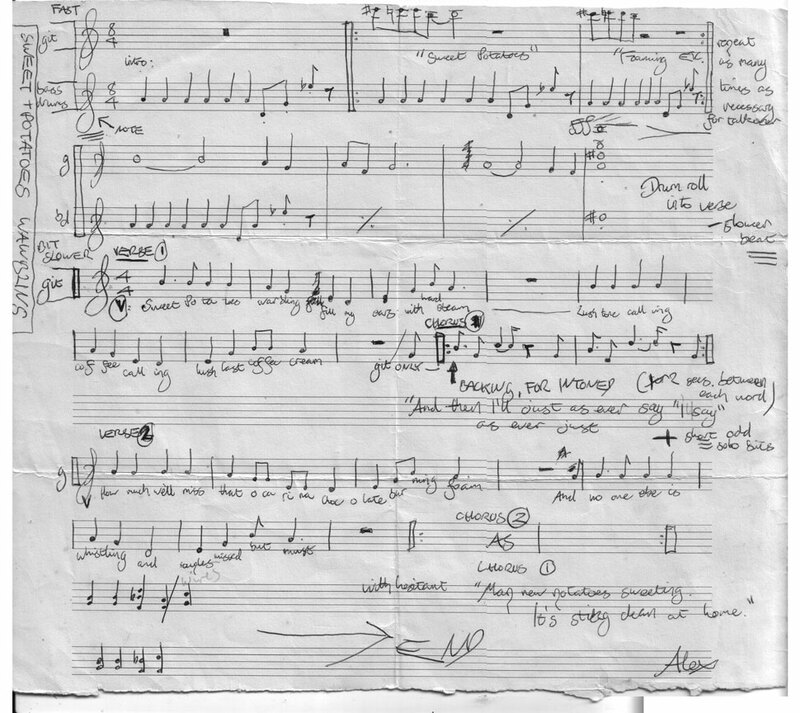 Skyscraper was originally written by Glyn Bush for the D-Go-Tees but Alex wrote his own version for the Emperors and Alan furbished new lyrics for that. Meanwhile Glyn Bush did his version of Alex’s Do The Bum’s Rush and Sweet Potatoes Warblin’ . 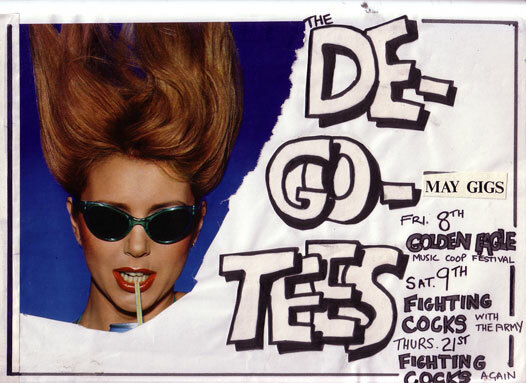 They appeared in the D-Go-Tees live set and home demos has been also recorded around 1980. Emperor’s first proper full rehersal. Alan sang his The Wide Boys lyrics over the top of a jam. Pickle did most of the groundwork of teaching everybody the music. Pickle formed his band Dapper Choir which also consists Alan and Alex. At some point The Emperors and Dapper Choir seems to turning into two contrasting expressions of the same band. Pickle wrote most of the Dapper Choir songs like Monster Parody, Ready Remedies. Andrew James also contributed with some lyrics. He wrote Caption Music and Venus of the Hardsell which later appeared in Hellblazer as a Mucous Membrane song. Pickle recorded a home demo with Cathy Frost. „BY NOW, however, the acrid scant of destiny was in Licquorice’s abnormally large nostrils. He had already formed the crepuscular choral formation known as the Dapper Choir, a cabaret conglomerate whose personnel were highly unstable in most accepted senses of the word. The by-now consumptive Max Akropolis returned to furnish saxaphone accompaniment, and even your scribe was on occasions enlisted to lend a rich Basso Profundo to the vocal section. But the spider at the centre of this web of creativity was undoubtedly Mr. Licquorice himself, crouched over his piano like a hunchbacked vampire, long waxen fingers stabbing spastically at the ivory. Melodies would flow effortlessly foum him, words of simple truth hung on exquisite refrains. Andy Broughton didn’t appear at the rehersal because of his commitments with The Hatricks. He left the band very soon and Pickle filled the spot temporarly. „Contrary to the above statement, I first met Alan two days after that fateful rendezvous with mister Green. Ushered into a dank basement flat in Colwyn road, Northampton, I became the delighted witness to a scene straight out of Kerouac’s ‘The Subterraneans’. There was the imposing figure of Alan Moore holding forth in the center of the small room, the walls of which were covered with reversed posters, picture side facing the wall(! ), proclaiming that “Old gansters never die!” Whilst Alex blew smokey ribbons of saxophone sound , a sandy haired angelic looking boy known as ‘Seaweed’ scratched at a cheap electric guitar and the strange and inscrutable Doctor Pickle a.k.a. Mr. Liquerice ran skeletal fingers over the keyes of an ancient Wurlitzer. Various small time criminals and denizens of the local underground art scene nodded approvingly in the sepulcheral corners. I also nodded and eventualy joined in. With Northampton being a small place, it was inevitable that the paths of Moore and J would cross. 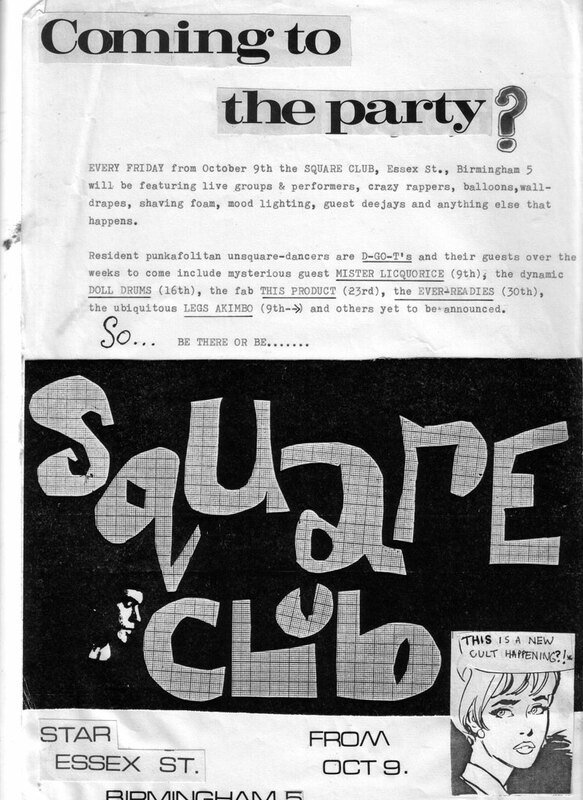 This first happened in 1977 when Moore had put an advert in the local paper seeking not musicians but “co-conspiratots”. Alex tried to find a replacement guitarist and re-contacted David J Haskins. David J couldn’t join the band because of his commitments with Bauhaus. New replacement guitarist referred as ‘Nev Guitar’ left after one rehersal. Alan backed out of The Emperors because of his cartoon career but he remains the Emperor’s lyricist and producer. As Pickle recommended Alex left the band to rest for a few weeks. Alex got another new (possible) drummer for the band called Fred Ryan. Alex joined a raggee-ska band called The Army. Special thanks to Glyn Bush & Pickle. „Another Suburban Romance – that was a play co-written by Alan Moore and Andrew James (Old Gangsters Never Die came from this play). Regarding Alan Moore: Storyteller book, the original Old Gangsters Never Die monologue was written a bit earlier for Northampton Art Labs performances but later incorporated to the play. Alan brought it into the Emperors and later The Sinister Ducks. The Ducks version has been recorded at the Beck Studios in 1983 and appeared on the B-side of The March of The Sinister Ducks 7” single. Remastered version released on the second bonus CD of David J – Etiquette of Violance 2013 reissue. 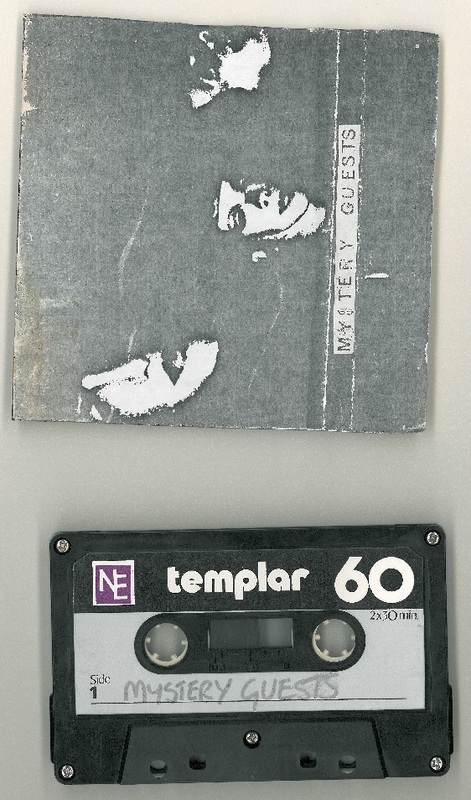 Alternate 10 minutes long version has been recorded by the second incarnation of The Emperors of Ice Cream around the ’90s and also appeared in their live set. I wrote some music for the play along with my friend Pickle (PK) and we performed a song called the Whore’s Poem at the Racehorse. I can’t remember if Alan was involved, he may have been in the audience. The play was never finished or performed anyway. The music was pretty crazy and tricky to play, very prog/Zappa ish. It was largely instrumental apart from the Whores poem. Alan left us to our own devices. ‘Another Suburban Romance’ was an early Alan Moore/Andrew James collaboration. Written in play form, Glyn and I wrote and recorded the incidental music. Each Character had a signature tune. Hence the Whore’ Poem. Guitar demos have been recorded for Another Suburban Romance play including Whore’s Poem. 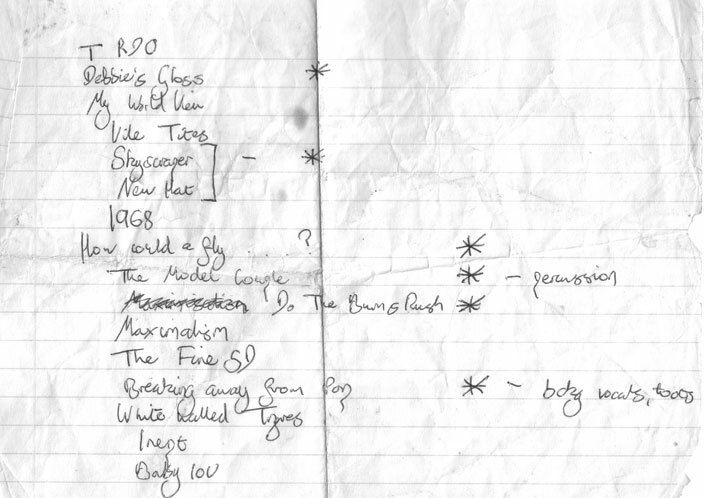 The song also appeared in the live set of The Mystery Guests around ’81. 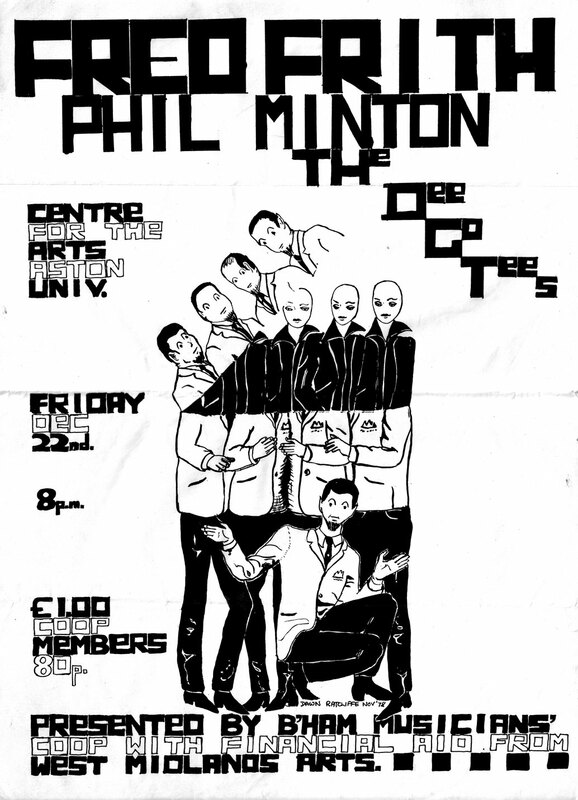 Audience recording of their Warwick University gig exists. Short piece of Another Suburban Romance horns intro was podcasted as part of The Dandy Hour Episode 8. It can be heard in the background from 10:55 to 11:27. That was re-recorded recently from the original score. We had an idea to do it as a Dandelion Set track but it didn’t work out. The recording was never finished ..no bass drums organ etc and what there was …. just horns is not even mixed. 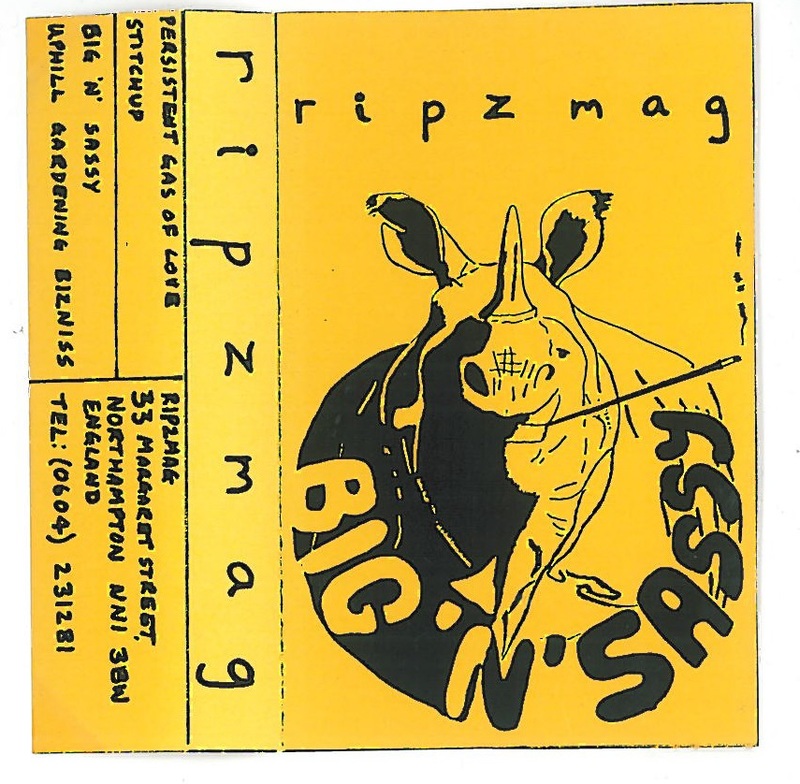 At least two versions have been recorded by The Satanic Nurses and The Emperors of Ice Cream later in the ’90s, although they have nothing to do with the original music written by Pickle and Glyn Bush. First illustrated version of Another Suburban Romance lyrics was printed in Negative Burn #9 (March 1994). Second comic strip adaptation appeared in Alan Moore’s Another Suburban Romance (Avatar Press, May 2003). It was mentioned in Alan Moore : Storyteller book and at Glycon website. Comic strip adaptation appeared in Alan Moore’s Another Suburban Romance (Avatar Press, May 2003). Marvellous to think we had the nerve to write music we couldn’t play! 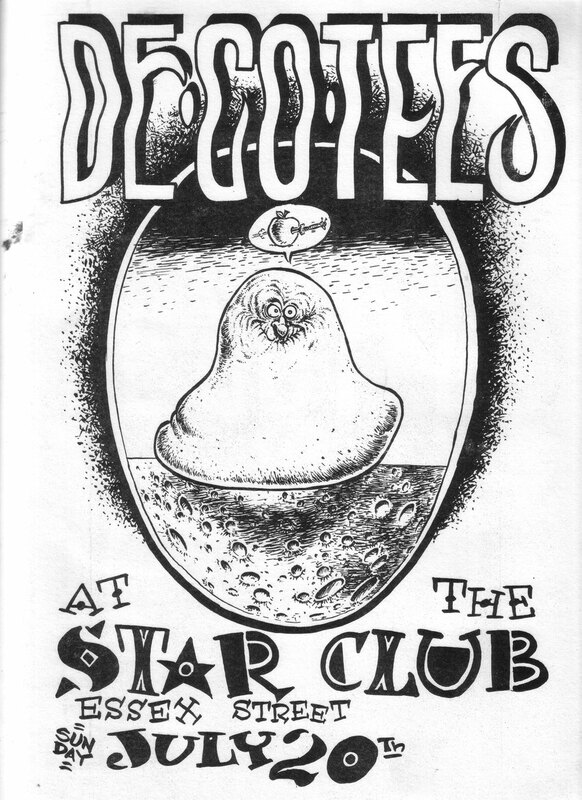 First band by Pickle (Dapper Choir, Mystery Guests) and Glyn Bush (D-Go-Tees). 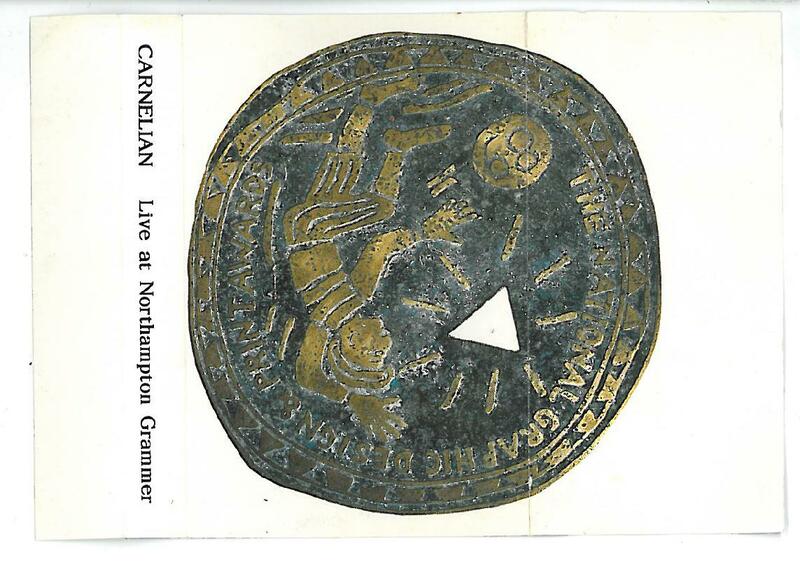 Carnelian had a residency at the Racehorse pub in Northampton. After the demise of the band Andy Kennedy and Coach York went to form Escalator with Alex Green (Emperors of Ice Cream), Adrian Utley (Portishead) and Will Ballard (bass).